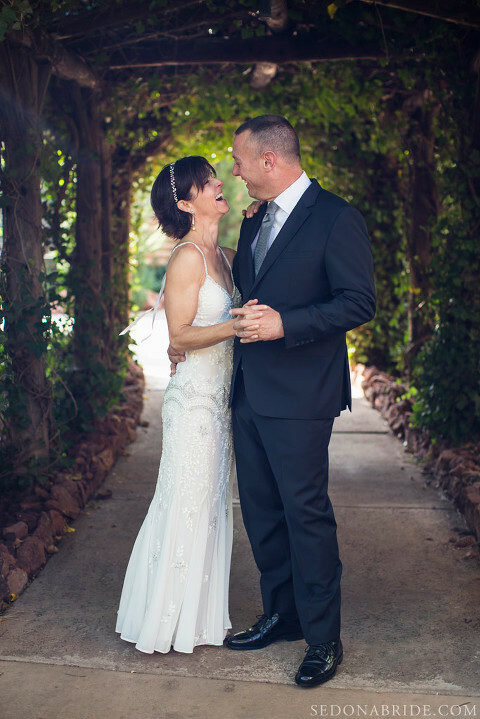 Stacy and George wanted their intimate Sedona elopement to be someplace special. The decision was easy because Sedona offers such an incredible diversity of beauty; from lush creekside in Oak Creek Canyon, to dry desert and red rock backdrops. Being locals, it was easy for us to help them find the perfect combination of both! 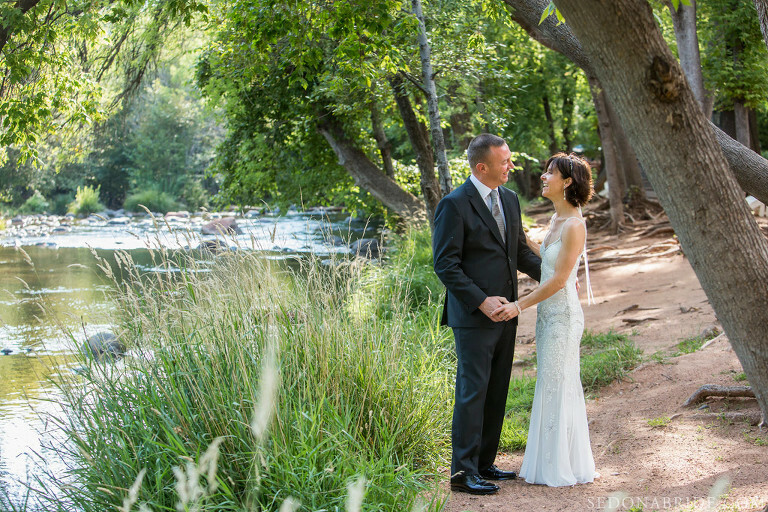 The elopement started off at the L’Auberge de Sedona Resort and Spa, located in uptown and right along Oak Creek. After Stacy and George’s quick preparation there, it was time for a few romantic ‘ first meeting’ photos. L’Auberge has a lot of great little spots for creek-themed photos, so it was easy to find some lush green by the creek. After the portraits, we left for the ceremony. After a hike out to the site, Sedona wedding officiant Karen Lynn performed a beautiful ceremony right on the creek. Red Rock Crossing is so unique because there are literally 100’s of perspectives offering unique views. Stacy and George had a very intimate and personal ceremony, with heartfelt vows, ring exchange, and even moments of laughter. We’re so happy for you, Stacy and George! We wish you a lifetime of happiness, and a lifetime of beautiful memories we got to share with you on this day! 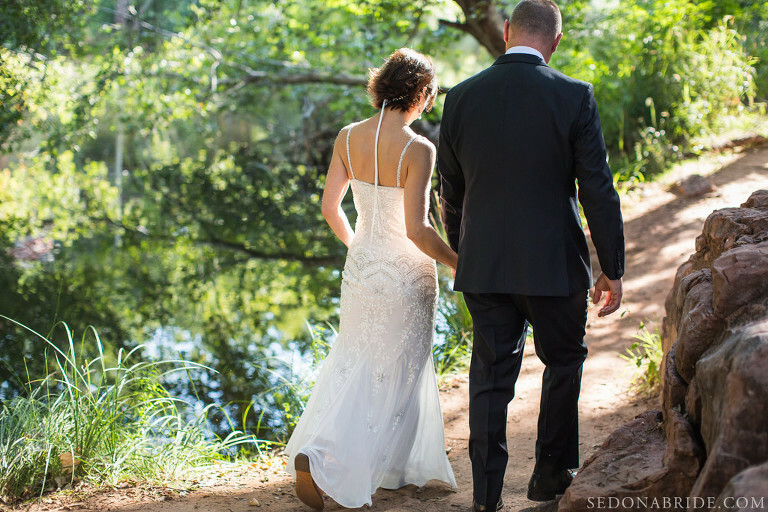 Contact us now to schedule your intimate Sedona elopement! Scheduling an intimate Sedona elopement with us is easy-as-pie! Some times of year are busier than others, so the further ahead we can schedule, the better. We’d love to have a chance to work with you! 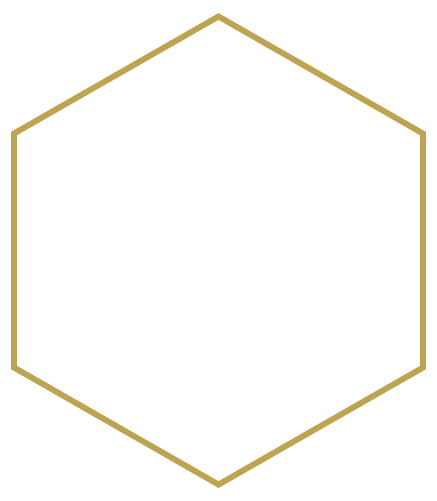 Click the ‘ Contact’ button above to begin the process of learning more. 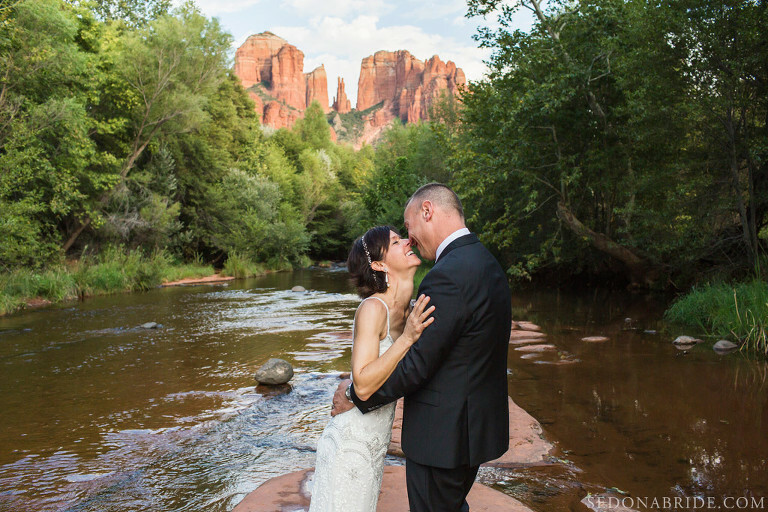 Click here to see a beautiful elopement at The Knoll and Red Rock Crossing by Sedona Bride.